When it comes to searching for dump trucks for sale, you might be intrigued to know that you aren’t just limited to the large ones you see meandering from construction site to construction site. If that’s what you’re looking for, then great. But, did you know that a Silverado 2500/3500HD model can have a dump body installed on it? That’s right, and while it might not hold (or dump) as much as a larger dump truck, it could be a perfect fit for your company. The customization doesn’t just end there, and it turns out that a Heavy-Duty Silverado can be used for more than you think. Such as throwing a flat bed on it, or installing a crane or bucket. This provides the SilveradoHD with a whole new level of utility in the working world; something contractors and companies alike are always looking for. What can these be used for? Read on to find out the benefits of having such a configuration, and real-world examples of what each one could be used for. Perhaps one of the most useful tools of the trade a contractor (or a business) can have is a dump truck. It’s not as hard as you think to get a dump body conversion installed on your Silverado. Since there’s three different types floating around. The first type of dump body conversion for your Silverado is a dump bed insert. These types of conversions are available for both a long and short bed pickup, and can be transferred to a new kind of pickup if you (eventually) upgrade your work truck to a newer model year. As long as it has the same bed length, of course. They don’t require too much modification to the bed of the truck, and they don’t even require the bed to be removed. Which means the truck will look (relatively) stock; right down to the fuel cap and filler hose remaining in the original location. On the downside, these do tend to add extra weight. Which infringes upon payload capacity. The second type of dump body conversion is known as a stealth-style hoist conversion. If you thought you’re Silverado HD would look vanilla with a dump bed insert, then you’ve never seen a stealth dump bed. This dump bed is virtually undetectable until you actually raise the bed. Which guarantees that the truck will look 100% original. However, installation is more involved for this type of dump bed conversion. Welding parts together, and modifications to the fuel fill location and bumper will most-likely be involved. But if you care about having a hidden dump body, then this is the way to go. A full dump body conversion is perhaps one of the most common types of conversions out there. It involves removing the entire stock bed, and replacing it with an aftermarket dump bed. Many trade contractors prefer this option simply because it allows you to maximize the payload capacity by saving weight — since you’re just replacing the weight, not adding to the existing truck beds weight — and gives them a dedicated work truck. Naturally, a new pickup bed being added on means you’ll see some changes to the truck itself to accommodate it. There’s no best choice here; it’s all what works for you and your line of work/company. Each type of conversion has pros and cons you’ll have to look into some more to make a more informed decision. What Trade Can It Be Used For? If you have a landscaping company, you’ll love the addition of a dump truck. Imagine having a wheelbarrow that’s unable to dump. That’s what it’s like for a landscaper with a stock Silverado 2500HD truck bed. You’ll have to shovel all the loam (or other material) out by hand in the desired area, instead of just dumping it with the push of a button. For the same reason — moving material — a construction contractor that uses a Silverado 3500 will appreciate the addition of a dump bed. It really beats having to remove large boulders or stumps by hand from the truck bed. It’s not just a dump body conversion you’ll find on a Silverado. In fact, you’ll also find flat bed conversion kits for a Silverado 2500HD or 3500HD floating around. A flat bed is, exactly as it sounds. Typically wood, a flatbed is a flat piece of material that’s placed in lieu of a stock pickup truck bed with sides. A flat bed can also be converted to dump, but typically they are left in a fixed position. Simply because the lack of sides makes it difficult to transport material that might need to be dumped. However, that same weakness when it comes to transporting loose materials is a huge advantage for objects that can be strapped or tied down. Why? Simply because it gives you a flat surface to do so, without the restriction of the siding of the bed. Thanks to the lack of siding, it also makes easier to load and unload materials. Flat bed pickup trucks are used in multiple ways. Namely, it’s for fencing (transporting fencing), lumber supply (transporting lumber), plumbers (transporting pipes), and any other trades that would require raw materials to be transported. A couple other less common conversions that you might see floating around on a Silverado 2500/3500HD would be a a crane conversion kit, or a bucket conversion kit. 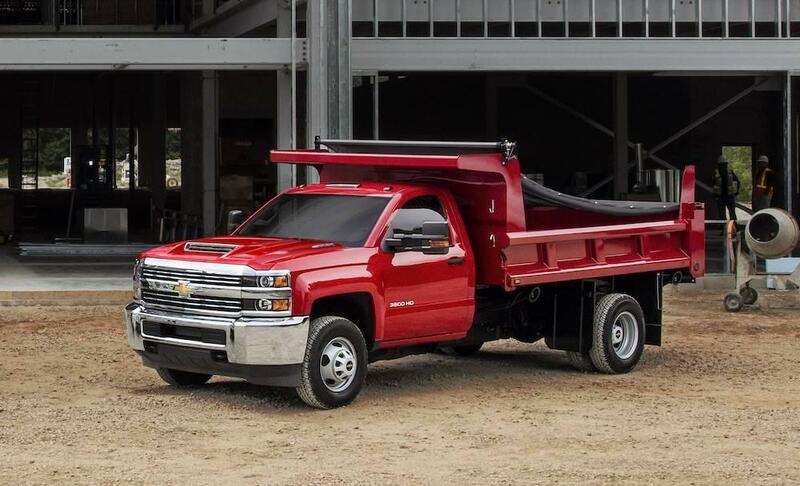 Installing a crane on your Silverado 2500 or 3500 model gives you even more versatility. It allows you to hoist heavy objects into the truck bed with ease, making trades that require heavy-lifting easier (and safer). If you opt to install a bucket, then you’ll be able to take your Silverado 2500/3500 to new heights. With this addition, you’ll be able to climb into the back of your bed and get in a bucket. Then, use the controls to raise it up. Often, you’ll see electrical companies that work on power lines or other hard to reach places with these. Also, if you start up a tree removal business, a bucket truck is a necessity for out-of-reach parts of the tree. When you’re ready to convert your Silverado 2500/3500 over to one of these body styles, DePaula Chevrolet in Cincinnati, OH has the knowledge (and connections) to make that happen. We can even throw a body wrap/company decals on your truck to help with advertising.